← The Church of God and Women in Ministry: We Can Do Better! “If we’re going to reclaim the neighborhood, we have to stop keeping people at a safe distance, and let them in.” Steve Arterburn’s profound, yet simple words seemed to echo in the expanse of Vancouver Church in Vancouver, Washington, during the last week of April 2016. It was the first of three Regional Conventions challenging the Church of God to reclaim our neighbors—and our neighborhoods—for Jesus Christ. Inspired by the Holy Spirit, Steve’s message wasn’t the only one cutting to the core of who we are as a movement. Milton Grannum, Ben Hardman, Arnetta McNeese Bailey, and Reggie McNeal also delivered God’s Word with conviction and clarity to the several hundred Church of God people gathered from up and down the West Coast and beyond. Social media lit up during the event, offering those waiting for the Anderson or Philadelphia conventions a foretaste of the movement-energizing experience. Photo: Reggie McNeal speaking in Vancouver. Attendance at the first-ever Regional Convention and the CHOG Table that followed spoke volumes about the bright new day dawning in the movement. 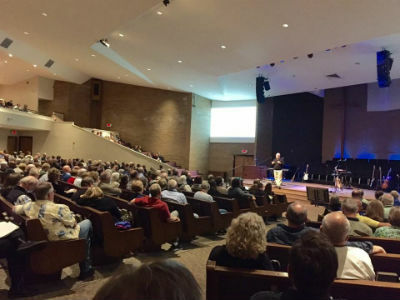 The Western Area Regional Ministerium (WARM), which usually holds its conference every year, decided in advance to merge its event with Reclaim 2016. Not only did participation increase several times over this year, but reports on the ground also indicate that their pastor appreciation dinner during Reclaim 2016 was sold out! Alanna Story, products of the Church of God themselves, led convention-goers in Spirit-filled times of worship. Many of the songs they incorporated into the sessions are featured on a new hymns CD and worship-leader resource they introduced in early April. At a pause between powerful moments of worship and teaching, Global Strategy commissioned Jason, Abby, and Josiah Torgeson as missionaries to Costa Rica. Photo: Alanna Story leading worship in Vancouver. These quotes fail to tell the whole story or paint the entire picture of Reclaim 2016. The good news is that the convention program is the same at each location! You can register for the Regional Convention in Anderson, Indiana (June 21–23), and/or Philadelphia, Pennsylvania (September 27–29), at www.chogconvention.org. Learn more about the CHOG Table at www.chogtable.org. This entry was posted in All Church of God, Church of God Convention, Western and tagged Alanna Story, Arnetta McNeese Bailey, Ben Hardman, camp meeting, CHOG Table, Church of God Regional Convention, gathering, Milton Grannum, Reclaim 2016, Reggie McNeal, Steve Arterburn, Vancouver Church, WARM, Western Area Regional Ministerium. Bookmark the permalink.